Whether you need a simple cleaning and exam, a same day crown, porcelain veneers, a dental implant, or a complete smile makeover, then we can help. Let us show you how our talented and experienced staff can perform any dental procedure from the simple to the most advanced with painless precision. [spoiler title=”Invisalign” open=”1″ style=”1″ ] Invisalign treatment consist of a series of aligners that you switch out about every two weeks. Each aligner is individually manufactured with exact calculations to gradually shift your teeth into place. And since your Invisalign system is custom-made for your teeth and your teeth only, with a plan devised by Dr. Wells, you know you’ll end up with a smile that truly fits. [spoiler title=”ZOOM! Whitening” open=”0″ style=”1″ ] The ZOOM! technology boasts dramatic results, with an average improvement of six to ten shades in one office visit. The ZOOM! lamp, utilizes a proprietary UVA light to aid in the whitening process. The procedure, which is completely safe, involves a short preparation to cover the lips & gums so that only the teeth are exposed to the light. ZOOM! whitening gel containing hydrogen peroxide is placed on the teeth. Then the light, which activates the gel, is placed in front of the teeth. The combination of the light & gel penetrate the tooth enamel’s outer layers to break up stains & discolorations. This process is repeated three times in one office visit that lasts roughly one hour. Maintaining healthy gums is vital in preserving beautiful teeth and, in general, good overall physical health. Periodontal disease is a silent and destructive disease of the supporting structures of the teeth including the gums, jawbone and periodontal ligaments. At least 80 percent of adults who have periodontal disease experience bleeding gums and bad breath among other possible symptoms. Periodontal disease is linked to many other diseases that affect the body, including coronary artery disease, diabetes and a weakened immune system. If we diagnose gum disease, it is extremely important to eradicate the infection and prevent tooth loss, damage to surrounding structures, and the compromise of your overall health. Dr. Wells and his knowledgeable dental staff will educate you about gum disease and effective methods of prevention that you can utilize at home to keep your smile healthy and beautiful. Treating periodontal disease seems to be a procedure that causes so much confusion for patients in trying to understand the difference between “just a cleaning” and Scaling and Root Planing and the need and reason for this procedure. Scaling and Root Planing is done to remove tartar and hard crusty calculus, that is loaded with bacteria, around and BELOW the gum line where there is a pocket formed around the tooth greater than 4mm. 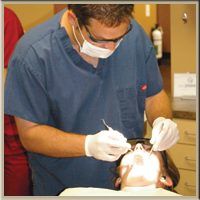 A professional dental cleaning or prophy removes only the soft sticky plaque that is above the gum line. Digital X-rays offer the advantage of an 80 percent reduction in radiation. There is no need for film or processing chemicals. Images are produced almost instantaneously and we have the ability to use color contrast and other valuable tools on the image. The speed in which a dentist gets to see the image is about three seconds.